New Super Mario Bros. Wii has turned two! New Super Mario Bros. Wii was released on November 15, 2009. It was developed by Nintendo's EAD studio, and published by Nintendo. The game received an ESRB rating of "Everyone" with "Comic Mischief" listed as content for parents and gamers to be aware of. How many hours have Wii owners spent playing New Super Mario Bros. Wii over the last 2 years, with 736 days possibly reported? Let's take a look! Our fridge stuffed with Thanksgiving dinner! After eating, our oldest son and I went into our backyard for almost an hour, and he ran around collecting rocks from one side of the yard, and throwing them to the other side. He even created "rock slides", by picking some up and dropping them down his slide. A new meaning to the term, "rock slide". Soon it was his nap time, and I followed his example by passing out for about an hour. I just made another pot of Yuban coffee, and am enjoying my first cup as I type this. Later tonight will be some video game play-time, then bed, before heading into the crazy work world tomorrow! I hope you all have had a great Thanksgiving, and just a great day in general, and hopefully you all have been able to find some time to relax today. 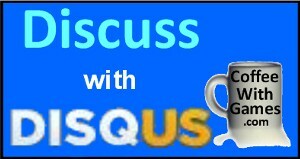 Do any of you plan on leaving soon, or perhaps you already have, to go shopping for some deals? This is one of GameStop's occasional video game sales that I wish I could take advantage of. GameStop stores and GameStop.com are running a "Buy 2, Get 1 Free" sale "on all in-stock pre-owned products". The sale is happening right now, Thanksgiving Day(Happy Thanksgiving! ), through this Sunday, November 27. The sale includes pre-owned games for the 3DS, DS, PS3, PSP, Wii, and Xbox 360 systems. If you see any games worth grabbing that you think are too great to pass up, leave a comment letting us know(causing me further torture, because I will resist). You can browse the online selection of games they are offering, HERE, Buy any 2 pre-owned games get 1 free at GameStop.com! According to one "professional" reviewer for Modern Warfare 3 on the Wii, "The words 'Wii' and 'online multiplayer' aren't used in the same sentence very often...". Call of Duty: Modern Warfare 3 released 2 weeks ago, and I have been playing it a good bit since I received it. The Wii has single-player focused FPS games like Metroid Prime 3: Corruption which lack multiplayer of any sort, and the more online multiplayer focused FPS games like the Call of Duty games. 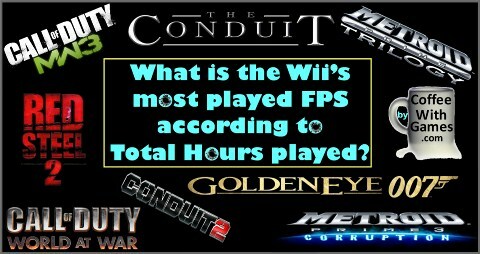 While the Wii may not have as many FPS games as the PlayStation 3 and Xbox 360, it has had at least one FPS released every year with online multiplayer since 2007. 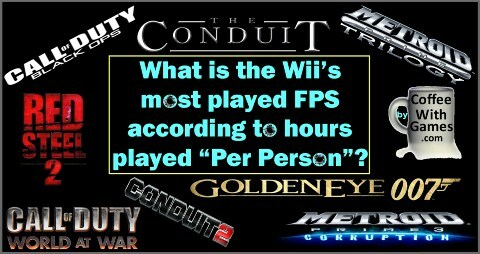 What is the most played Wii FPS according to "Total Hours" played, as reported through the Nintendo Channel, and does it have online multiplayer? Can you guess it before seeing the answer? Let's take a look! 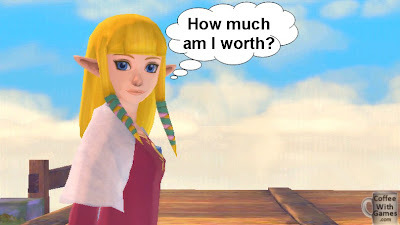 The Legend of Zelda: Skyward Sword's Trade-In Value Is? The biggest Nintendo Wii game of 2011 released today, The Legend of Zelda: Skyward Sword. Many of you reading this may have already picked it up, and found yourselves many hours deep into the Zelda universe. I was looking at video game sales on Amazon.com earlier today, and decided to check out what the user reviews were saying for The Legend of Zelda: Skyward Sword. I'm always intrigued whether the early reviews appear legitimate, or if they appear like fan boys(that perhaps haven't completed it) just rating up a product they want to see do well. What I found more interesting than the reviews for the game though, was how much trade-in value Amazon.com is giving for The Legend of Zelda: Skyward Sword. How much is The Legend of Zelda: Skyward Sword's trade-in value worth according to Amazon.com? Let's take a look! The Legend of Zelda: A Link to the Past was originally released for the Super Nintendo Entertainment System on April 13, 1992. The Legend of Zelda: A Link to the Past was re-released for the Wii's Virtual Console service on January 22, 2007. The Virtual Console version can still be purchased for just 800 Wii Points, which is $8.00. If you are a serious video game collector though, and you want the original SNES version brand new, you can purchase it for about $300.00 on Amazon.com, HERE! 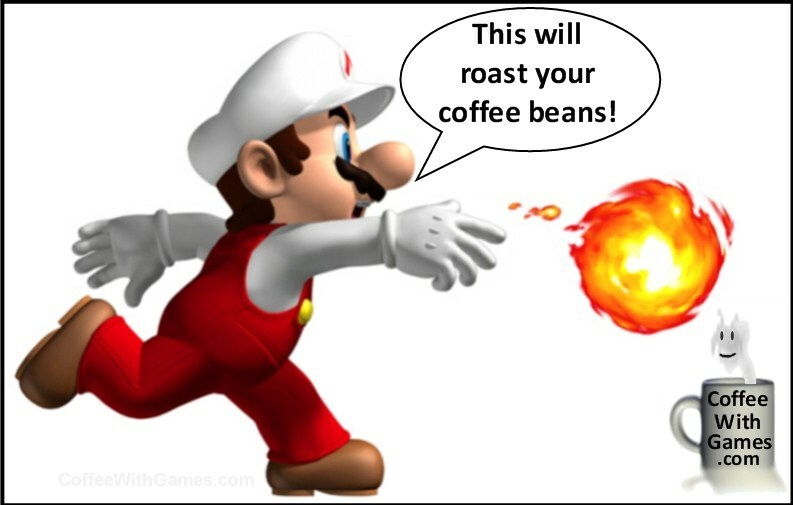 The Virtual Console release received an "Everyone" rating from the ESRB with "Mild Animated Violence" listed as content for parents and gamers to be aware of. How many Wii gamers have reported playing The Legend of Zelda: A Link to the Past through the Virtual Console, and how much money has Nintendo made from the game with 1,757 days possibly reported? Let's take a look! 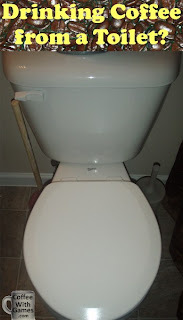 Have you ever heard the phrase, "My coffee tastes like toilet water! ", or something similar? Well, I drink my coffee black, so some of you may think that phrase applies to my coffee. 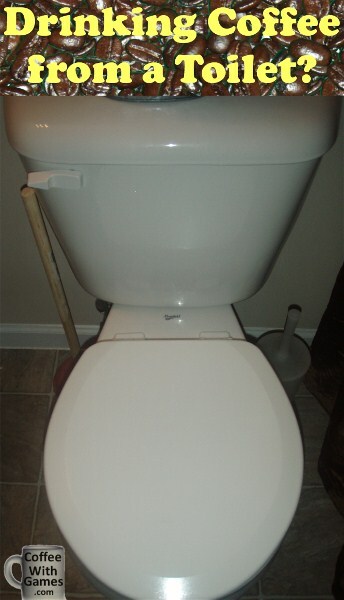 It has gone a step further though, and I can now say that I have consumed coffee from a toilet, and I will continue! What do I mean that I have consumed coffee from a toilet? Take a look! Call of Duty: Modern Warfare 3 was released this past Tuesday, November 8, for all the current generation home consoles. The game was developed by Infinity Ward and Sledgehammer Games, and published by Activision. The Wii version of MW3 was ported to the Wii console by Treyarch, and it is the first Modern Warfare title to be released day one on the Wii along with the other console versions. 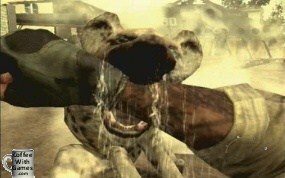 The game received a "Mature" rating from the ESRB with "Blood and Gore, Drug Reference, Intense Violence, Strong Language" listed as content for gamers and parents to be aware of. I played some of Call of Duty: Modern Warfare 3 on the Wii a few days last week, so what are my initial impressions of it? Let's take a look! Zelda II: The Adventure of Link was originally released for the Nintendo Entertainment System in North America on December 1, 1988. 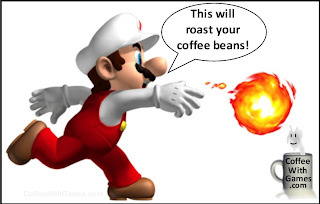 The game was re-released for the Wii's Virtual Console service on June 4, 2007, and can still be purchased for just 500 Wii Points, which is only $5. The Virtual Console version received an ESRB rating of "Everyone" with "Mild Fantasy Violence" listed as content for gamers/parents to be aware of. How many Wii owners have reported playing Zelda II: The Adventure of Link and how many hours have they reported playing it, since it was released on the Virtual Console? Let's take a look! 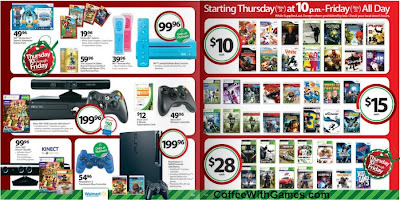 Wal-Mart just released their Black Friday ad, so shoppers can start sitting in lines now! Okay, maybe not now. Shoppers can start planning on what they are interested in though. 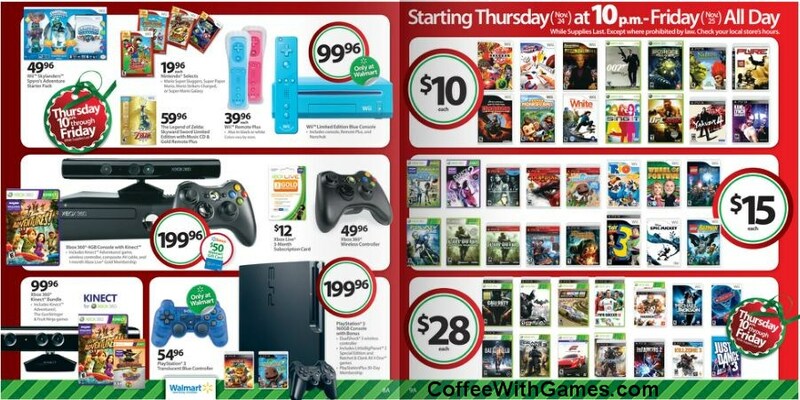 Take a look at the image below that shows some video game deals Wal-Mart will be offering. Seeing the PlayStation 3 bundled with two games for under $200 I think is a great deal, and the Wii console being under $100 will probably do extremely well also. Being that I don't own an Xbox 360, I would have been more interested in seeing the Arcade version discounted down around $150, and perhaps with a game or two bundled in. As for the video games being offered, Shaun White Skateboarding for only $10 on the Wii stood out to me, because of the Balance Board controls the game has and the fact I have enjoyed my time with Shaun White Snowboarding: Road Trip. Do you see any video game deals that you won't be able to pass up, and perhaps you are reading this on your iPhone while driving to Wal-Mart right now with your sleeping bag and tent? If you already own a lot of the games shown, are there any you would really recommend others picking up at the discounted prices? On January 21, 2010 I published an article titled, "A Serious Nintendo Wii Problem". In the piece, I wrote about how Nintendo could not keep New Super Mario Bros. Wii in stock at stores, and I showed how six of the largest retailers in the United States were "out-of-stock" of the game during the holiday season of 2009. Nintendo just released Kirby's Return to Dream Land for the Wii on October 24th. 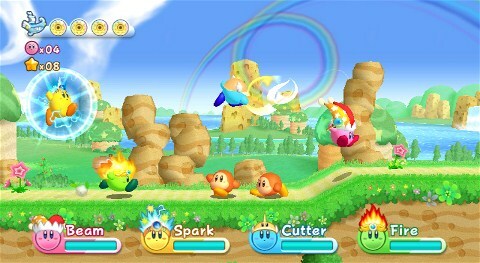 The game features cooperative play for up to four players, just like New Super Mario Bros. Wii, and it has received pretty good review scores overall. We are just now getting into the 2011 Christmas holiday season, and one site is currently sold out of Kirby's Return to Dream Land. Which site is sold out? Let's take a look! Amazon.com is currently holding a "Buy Two, Get One Free" video game sale. There are more than 800 video games to choose from, and many brand new releases are included such as Battlefield 3, Batman: Arkham City, Uncharted 3: Drake's Deception, and even the Nintendo Selects titles. So, if you're in the Christmas shopping mood this weekend, and looking for video games for family and/or friends, the "Buy Two, Get One Free" sale is probably the right place to start! If you missed the first three links to the sale, just click HERE to start browsing the selection. Last week, on October 25, I posted my review for some Ed Hardy Energy Snacks I had tried. You can read my review of the Ed Hardy Energy Snacks HERE. I used the Ed Hardy Energy Snacks to go 48+ hours without coffee, because I wanted to see if the Ed Hardy Energy Snacks really worked, and if they could keep me alert and energized like coffee does. In my typical post fashion, I broke it up into four different sections and ended it with the "Question" section. 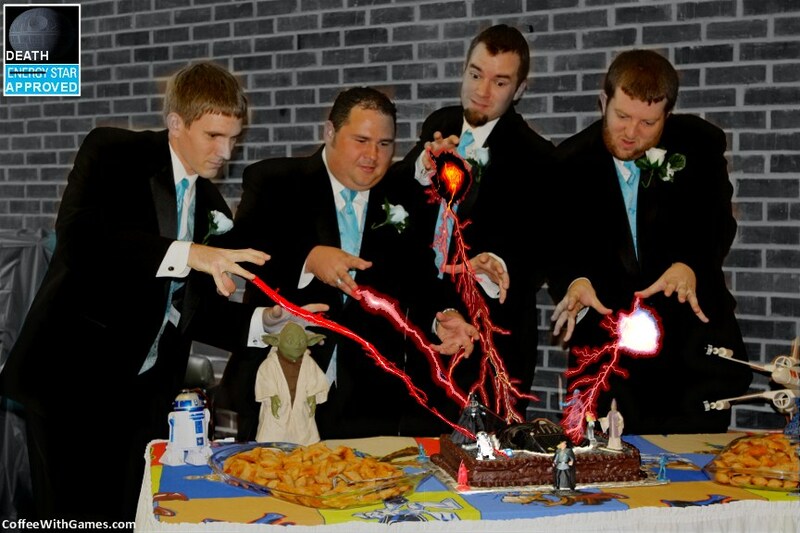 The very first question I asked was, "Would you like to try Ed Hardy Energy Snacks?" I said if you did to simply reply in the comments with, "I want Ed Hardy Energy Snacks more than my coffee!". 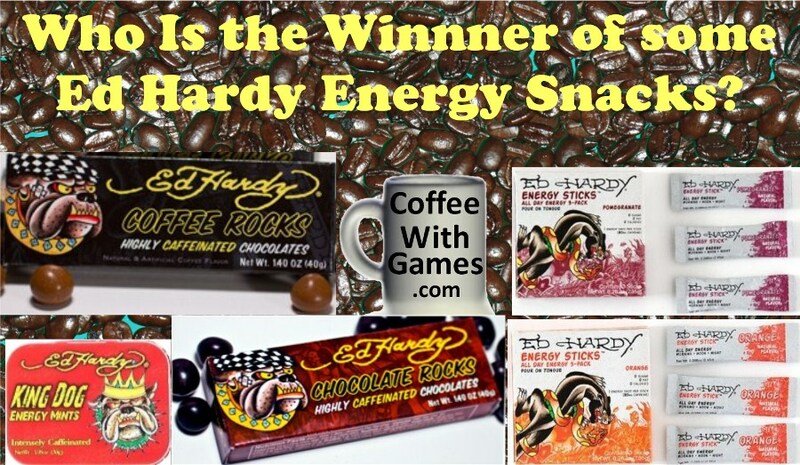 Well, the contest ended Tuesday night, and who won the Ed Hardy Energy Snacks giveaway? I turned a year older early in October, and you can read about some gifts Mrs. Coffee got for me HERE. I have been working more hours each week than I would like, especially with school and full-time family duties each day, but I am grateful for a job; especially one where I can grab a cup of coffee each day on my way home. Speaking of coffee, if you missed my review post, "Surviving 48+ Hours Without Coffee? 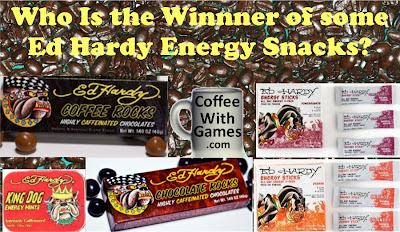 Ed Hardy Energy Snacks Review", you can read that to see how I went for just over 48 hours without any coffee, and I didn't get a caffeine headache! Now with November brewing, what coffees and caffeinated products did I consume and what games did I play in October? Let's take a look!